We wanted to make something completely different, so here are six little penguins! Each one stands about 11.5 cms high, and they are made from black evenweave fabric and white 14-count aida with felt beaks and webbed feet. The kits also contain pre-cut pieces of plastic canvas and the penguins are constructed with the same technique used to make our houses and keepsake boxes - lace the fabric to the plastic canvas and sew the pieces together. These penguins are not toys and have rather irregular shapes compared with boxes, so we think they may not be suitable for beginners. Each one has a cross stitched front and cross stitched images on the underside of the flippers. Each kit contains 14-count aida, evenweave, felt, wadding, DMC embroidery threads, plastic canvas, a blunt tapestry needle, charts and full instructions. 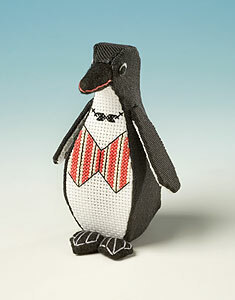 You will also need a reel of sewing thread, a sewing needle and a little glue to complete the penguin. Standing about 11.5 cms high, Mr. Penguin wears a smart waistcoat and has a large salmon and a flower on his flippers. Perhaps he's going courting!